There was strong bidding at today's Top Car sale at BCA Nottingham as hundreds of thousands of pounds of prestige cars were offered for sale. 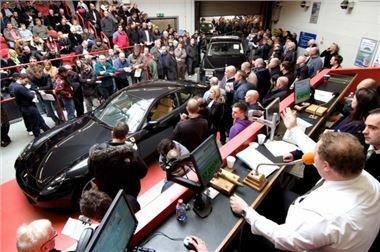 Hundreds of buyers participated - both in the auction hall and via the internet using BCA's Live Online bidding service. Top seller on the day was a privately-entered 2007-registered Rolls Royce Phantom that sold for £148,000. The Ferrari 612 Scaglietti F1A formerly owned by Chelsea and England soccer star Joe Cole was provisionally bid to £59,800 - which was being considered by the seller - while a brace of Bentley Flying Spurs realised £51,000 and £44,000. A Ferrari F360 Modena sold for £43,000 and a Range Rover Sports Vogue realised £36,000. Over £3 million of cars were sold on the day. BCA spokesman Tim Naylor commented "The current market for exotic, luxury and performance vehicles is notably stronger than it was last year, when values fell sharply. Prices appear to be making a recovery in 2009 and buyers are bidding very competitively, which suggests there is a little more confidence in the used car market this year." BCA has undertaken a major review of its classic sales operations in light of the wider economic conditions and the present state of the classic market. While the very top end of the collector’s market is in a healthy state, the same cannot be said of the mid-price sector that has been BCA’s strongpoint in recent years. It is our belief that this situation, given the current economic position, is unlikely to improve in the short to medium term. As a result, BCA has taken the decision to close the Classics from BCA department with immediate effect and adopt a new strategy for the sale of classic, vintage and collectable cars for 2009 going forward. Therefore the sale at Blackbushe scheduled for Tuesday 10 March will not be going ahead. In future, BCA will sell classics in conjunction with Top Car and Executive sales at Blackbushe, Bedford, Measham, Nottingham and Brighouse. Vehicles will be promoted via the Classics from BCA website which will be regularly updated with the latest vehicles entered for sale. Sales will be more frequent and managed locally around the BCA network, with vehicles marketed online via the BCA website. There will be a simplified and reduced fees for sellers, and buyers will pay the standard BCA buyers fee, which is much lower compared to every other classic auctioneers published rates. more regularly around our network." If you would like more information on buying or selling classic cars with BCA, please contact the BCA Call Centre on 0845 600 66 44.